Credence ID's Credence One is a hand-held device designed for mobile fingerprints and faces capture. According to the manufacturer, the device is based on a FIPS-201 / PIV certified fingerprint sensor. Optionally, the device can be equipped with contact and contactless smart card reader. Credence One is provided with pre-installed Android OS and allows to run custom applications. The device features high capacity battery and supports multiple wireless connectivity options. MegaMatcher 11.1 SDK – fingerprint and face capture. VeriFinger 11.1 SDK – fingerprint capture. VeriLook 11.1 SDK – face capture. Where to order this device? 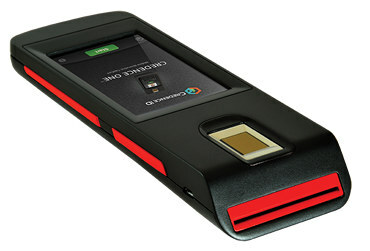 Buy Credence One at Biometric Supply – a subsidiary of Neurotechnology.